Blimey, it’s all go here. A text from BM this afternoon to say he’d got a Wood Warbler in his garden. Then this evening I refound JLI’s hitherto absent Barred Warbler in the plantation (am assuming it’s a re-find and not new in), and spent some time watching the still-present Paddyfield Warbler in the field, and making some notes. (How quaint! I used an actual pen and paper, and observed the bird closely from a discreet distance. What is it the youngsters do these days? Ah yes! I did not “digiwaste” it, nor “murder” it). Actually, that wasn’t through want of trying. I did have the camera, but the damn thing was prepared to sit out and show well in between stuffing its face with flies, just so long as you didn’t go anywhere near it, move suddenly, or breathe in a funny way. It was easily scared. 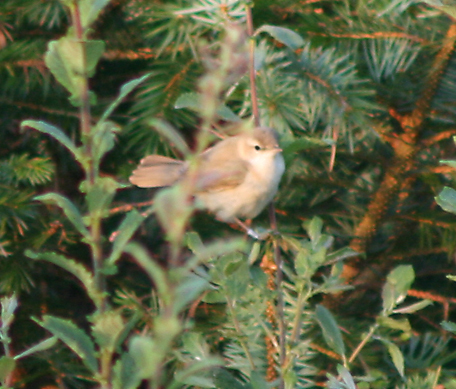 That said, I did manage a record shot (note the clinching field-mark – the ring!). Striking how pale it was in flight, and BM is easily excused for thinking Booted at first on a flight view. Even in the warm evening sunlight it looked kind of milky-tea brown. Sky’s clear outside. Bet it’s gone in the morning.